With wi-fi having spread to even the deepest darkest and most inbred corners of Appalachia, filmmakers have had to become even more creative about how they isolate their victims. 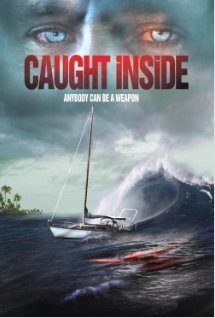 Caught Inside (originally titled, The Hedonist, a vestige of which remains as the name of one of the ships) is an Aussie surf thriller set in the Indian Ocean near the Maldives. A group of surfers are out on a boat, looking for gnarly swells. Along the way, what was supposed to be a guys only trip, is interrupted by the addition of two women: one supermodel type (Sam) and the girlfriend (Alex) of one of the surfers. This causes sexual tension as the alpha male leader of the group Bull (an Aussie version of Bret “The Hitman” Hart crossed with a squat Iggy Pop) sets his sights on the sole single girl for thousands of miles in either direction. In the interim, everything is A-Okay, surfing, sunbathing, playing with porpoises and all sorts of fun. Alex is a budding filmmaker and sets her camera on all the various goings-on. Early in the trip, Bull gets into a scrap with another surfer out in the middle of the ocean. When they get to shore, his shipmates get a glimpse into his aggressive persona on video, when they witness Bull live up to his name and pummel his assailant bloody on the beach. When Bull returns to the ship, he says the foreigner slugged him first and he has the cut to prove it and this explanation is temporarily bought. Soon though, leggy Sam and nice guy Rob have hit it off and are shagging in the lifeboat much to Bull’s chagrin. On another island, the amorous duo set off to sunbathe and surf. While Rob hits the waves, Bull suddenly appears and applies sunscreen to an unknowing and half-asleep Sam before getting inappropriate with his hand. The ship’s captain (“Don’t call me ‘Skip,’ I’m not a bloody kangaroo”) intervenes and they leave Bull on the island by himself overnight to figure out how to proceed, before dropping anchor. A “Bull” rush after Samantha realizes it’s not Rob applying the massage/sunscreen. Bull uses the tides to drift back to the ship, at which point he terrorizes its occupants and we get a glimpse of how far people will go in the interests of self-preservation — far, or in the case of some of the males on board here, not far enough. Ben Oxenbould is great as the predator menace Bull, as is Harry Cook as the passive hippie Archie, a “grom,” (young surfer) reluctant to rock the boat. Leanna Walsman is solid as the budding filmmaker who takes matters into her own hands when her pusillanimous beau fails to step up. Caught Inside is a fun, tight, under -the-radar thriller, beautifully shot on a miniscule budget. To hear us discussing Caught Inside and the incredible LaserBlast, check out Episode 39 of the Really Awful Movies Podcast. This entry was posted in Horror and tagged 2010s movies, holiday movies, movies filmed in Asia by Really Awful Movies. Bookmark the permalink.